The Arrival of the French Girls at Quebec, 1667. Watercolour. By C.W. Jeffreys. Public domain, via Wikipedia. I remember the first genealogy project we did in middle school. I listened to my classmates talk about their Irish and English ancestry, going back well into the middle ages, and felt a bit down and out. Granted, I’d gone far in my maternal grandfather’s tree, all the way back to France, but the line abruptly ended in the 1640s. I wasn’t in the Domesday Book. I didn’t have ancestors on the Mayflower. There were no lords or queens or knights, as far as I could tell. But I couldn’t have been more off the mark in my disappointment. The biggest success story of my efforts with Ancestry.com is what I’ve been able to discover with my French-Canadian/Acadian/First Nation ancestry. The first is courtesy of my grandfather’s side of the family, and particularly the women nine generations back. My mother’s family, on her father’s side, goes back to the 1500s in France, and are among some of the first families to come from Europe to the New World. They were furriers and trappers, and in some cases potentially dispossessed nobles. But for the most part they were looking to start new lives in a very unforgiving landscape. The story of the French in Canada is a long tale of war and strife, but also of perseverance. As I tell my father in law, I’m not really a Yankee. I still have yet to find a relative who fought in the Civil War–but if you go beyond that, I do have relatives in the French and Indian Wars. They helped shape North America. Just from a different side. One of the things I’d never heard of before, that I discovered in my research, was the term “fille du roi.” Now, I’ve got enough French to know what it means (roughly translated, it’s the “daughters of the King“) and found that I was related to at least three or four of them, and a few single ladies through more than one line. Their names include Elisabeth La Salle, Marie-Madeleine Philippe, and Marie Grandin (my 9th great-grandmothers). But their story amazed me. 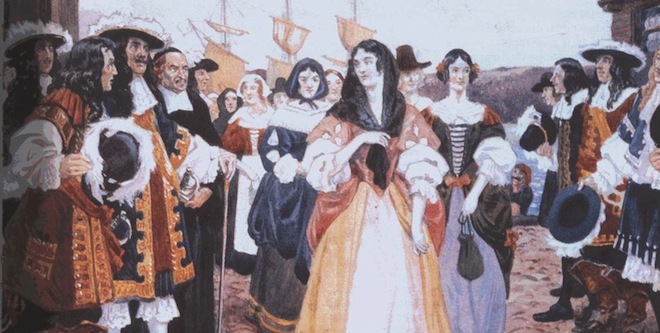 Between the years 1663 and 1673, women were shipped across the Atlantic to, well, do as women do. You see, New France had a big population problem. Lots of guys. Not so much with the women. Which from both a social and militaristic perspective was a concern. So basically, Louis XIV started a program wherein young women were sent to New France–with some dowries and other incentives–to marry well and procreate. All in all there were about 800 of these women, and while some came from nobler classes (often third or fourth daughters, or orphans) they came from many walks of life. Most went between the age of 12 and 25. They were not, as was rumored, prostitutes (which is a rumor that pervades to this day–in fact, when I’ve told this story to friends and family, and ask, “And who do you think they sent?” almost everyone says, “Whores!”). Regardless, the program was relatively successful–more than 2/3 of the women married and went on, literally, to be the founding mothers of French-speaking Canada. In the intervening years, there’s been much discussion about just what motivated these women and what their lives were like. More often, they weren’t country women. They were from cities like Paris, and had in many cases been raised in orphanages or middle to upper class homes. Data suggests that over 50% of the filles du roi had no living father. The dowry situation is particularly interesting, because it wasn’t a dowry in the common sense. The terms of the contract were particularly flexible for the women involved, and gave them license to annul the marriage (and keep their money) if the situation didn’t work itself out. That’s pretty forward-thinking for the 17th century. From 1671 to about 1700, she gave birth to nine children, three of whose birth dates or baptisms were not recorded or are missing. The five girls and four boys would all survive to marry, and, by 1730 (the last date for which data is given by René Jetté’s Dictionnaire Généalogique des familles du Québec), 48 grandchildren were born. Neither Marie nor Jean would see all of them, Jean dying sometime before an inventory of his belongings taken on 13 July 1714, and Marie on 14 July 1715, at about age 64, at Hôtel-Dieu, the hospital at Québec City. What life must have been like for these women is hard to imagine. Harsh doesn’t even begin to describe the wilds of New France in the 17th century. In a world dominated by men, these women were expected to birth a new nation. And they did just that. I suppose, for me, the significance of being descended from so many of these filles du roi is twofold. First, it gives me a sense of ancestry, akin to that of friends who claim their connection to the Mayflower. Sure, this is a few years later, but in some ways it’s more exciting. Which is my second point: These were women. Like me. While they were ultimately pawns in a scheme to bolster the population, they still had to tough it out. And, in the process, they were given rather unprecedented freedom, flexibly, and, depending on how you look at it, fortune. I only wish I knew more of their stories.